It’s a rainy Sunday afternoon, but it’s not keeping anyone inside. It’s busier now, I think, than it was last night. Fortunately Osaka’s main arcade streets are all covered. It seems like you could walk at least halfway across the city under the protection of a roof, if not inside subway terminals connected by pedestrian tunnels. There is an entire underground mall on the northern end of Shinsaibashi. Anyways, my intended subject of the day is Nanpa, or the Japanese pickup culture. Not trucks, girls. Well, guys too. 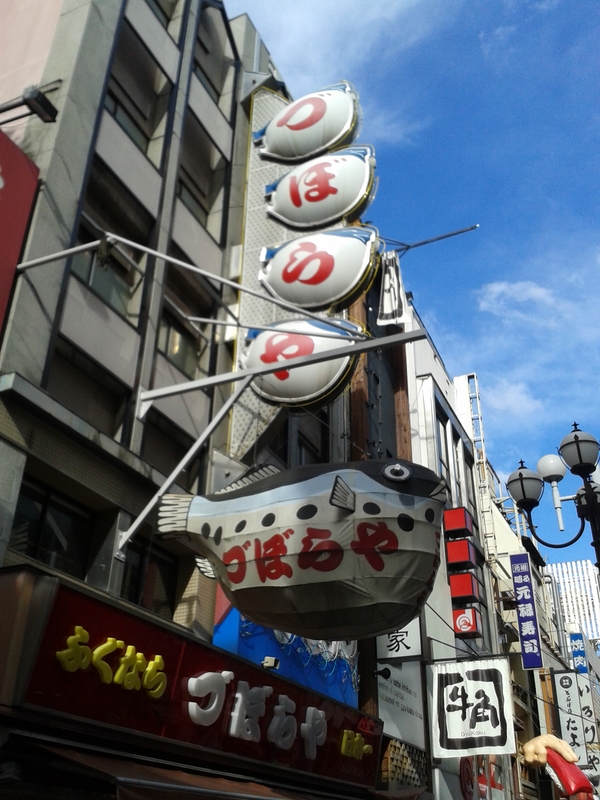 Dotonbori was once a famous pleasure district. Some of that remains, what with all the love hotels that charge by the hour, strip clubs, and hostess bars. Now it’s much lower-key, except at the Ebisubashi bridge. 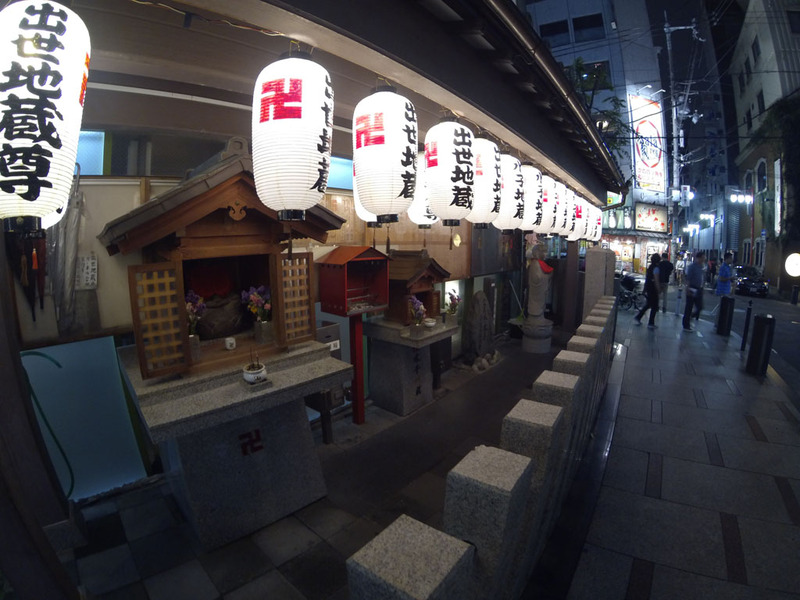 Ebisubashi is just the first, and one of its many, names (Ebisu being the Shinto god of fishing, workmen, and commerce; bashi meaning “bridge”). It has been previously known as Ayatsurishibaibashi (puppet show bridge) and is now called Hikkakebashi (snare/entrapment bridge). The locals just call it Nanpabashi. Here, the hip and not-so-hip Japanese men come to accost every single female who dares cross the bridge in an attempt to date them and, if possible, take them to one of the local love hotels for some good lovin’ body rockin’ boot knockin’ all night long. It’s not just the men. The women play their game here too (called Gyakunan, or G-girls). Most of the women gaming are professional host bar girls, looking to pull in customers. Some of the men are, as well (yes, there are professional male hosts). It’s like a colorful mating display; all the men and women alike try to stand out from the standard Japanese with dyed hair, piercings, crazy clothes. You can see anything from Yakuza wanna-be’s to ones who look like characters straight out of Anime. Then there are the goths, who actually use makeup to make their eyes look sad, and wear a perpetual frown, and both groups of goth girls and guys stand around looking mopey and never talking to each other, waiting until one side takes more pity on the other. The Japanese emo/goth girls have literally achieved perfection with the about-to-cry look. Mmm, long long legs and short short skirts… the Japanese G-girls have perfected this as well. Even the gaijin are not immune; in just 15 minutes or so watching this phenomenon, I was dragged into 3 throngs of giggling Japanese tourist girls who wanted to take their photo with the giant foreign barbarian. 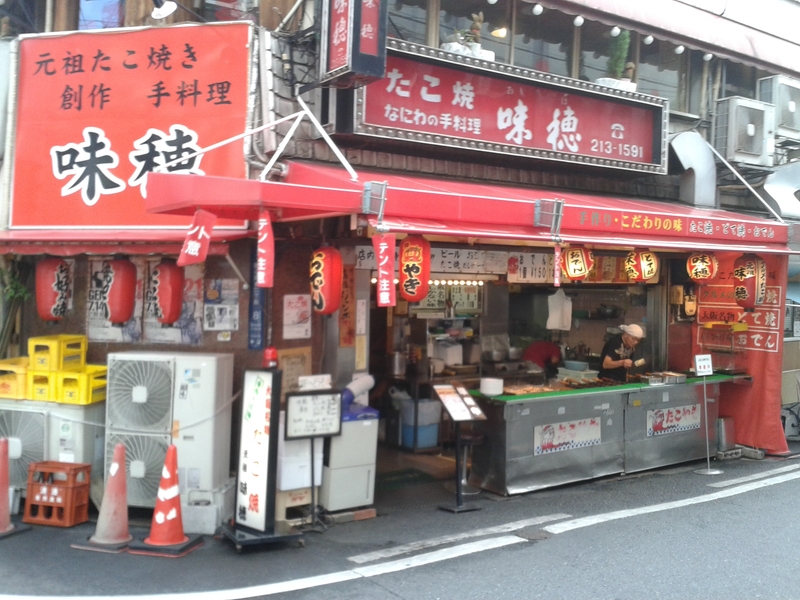 After breaking some hearts, I went back to the Doguyasuji arcade in search of my sushi knife. Ichimonji makes beautiful handforged, handcrafted blades, and they have a shop there. You can even get ones made out of Damascus steel. Anything from huge halberds with which to dismember whales, to samurai swords, to household cutlery. I opted for a more basic single-edged sushi knife, which still cost me more than my entire set of Kitchen-Aid knives back home but it is a piece of art in its own right. And I will get plenty of use out of it. I’ll take a photo of it once I get home; they wrapped it so beautifully in its box, I don’t want to take it out. 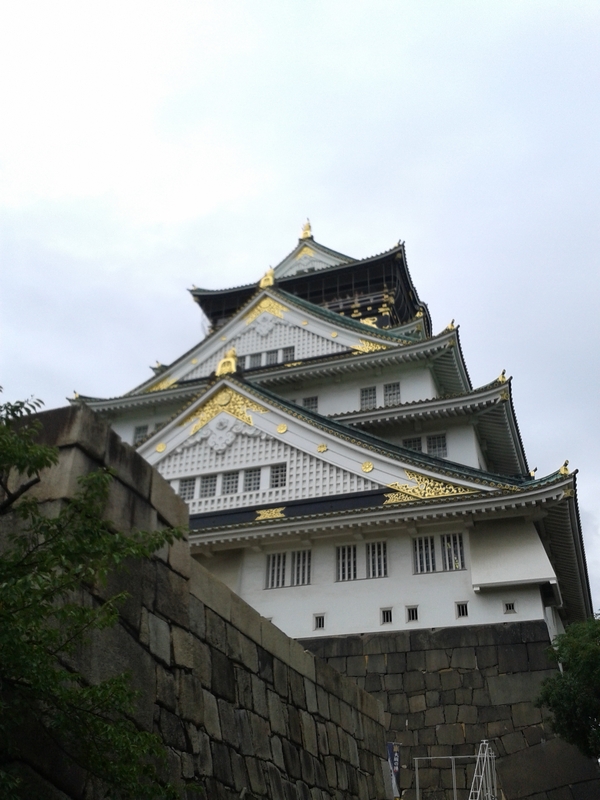 Today I slept in from last night’s food coma, and headed to Osaka castle around 11am. As it is a Saturday, and one of Osaka’s premier attractions, the castle was rather crowded, despite the weather, which was grey and threatening (and eventually following through) with rain. Osaka-jo was first built by Toyotomi Hideyoshi, who died the same year of its completion in 1597. It became the property of the Tokugawa clan after they laid siege upon it in starting in 1615, and shortly thereafter removed the Toyotomi clan from the gene pool. Since then it remained in Tokugawa hands, but the castle burned down several times from lightning strikes. Finally in 1868, rather than let it fall into the hands of the Meiji restoration, the Tokugawa clan burned it to the ground again. Then in WWII, its use as an arsenal prompted the Allies to blow it to hell yet again. So, what you see today, other than the stone outer walls and moat, is nowhere near original; however it is beautiful nonetheless and houses an interesting museum. Ahhhh, Engrish! Don’t worry, I will through from other side, after rematerialize. Beam me up, Scotty! 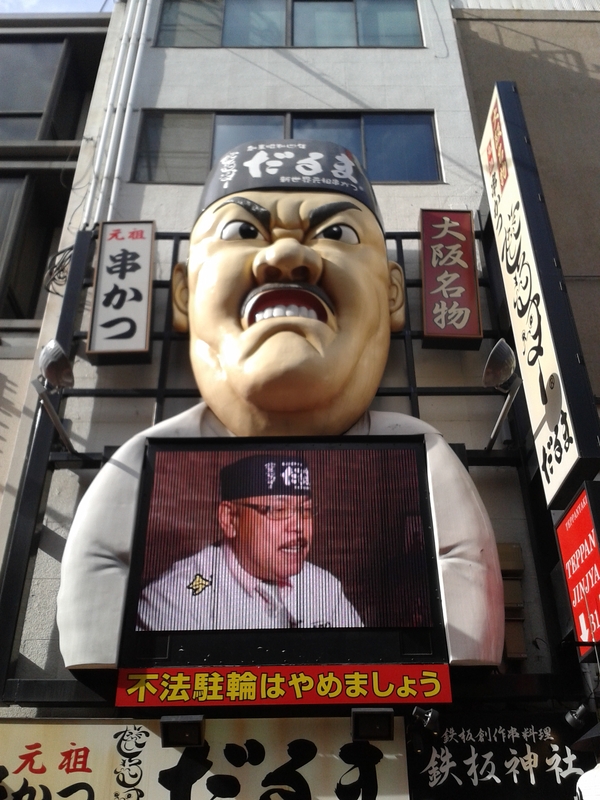 After marching around Osaka some more, I found the Doguyasuji arcade, which sells anything and everything related to restaurant equipment. All the fake sushi you can imagine, lanterns, teapots, etc. It is my intent to leave here with a professional sushi knife, and there is a foundry shop in there which makes beautiful stuff. I shall return tomorrow, if it is open, and, barring that, on Monday. The internet is an amazing thing. It now lets us filter through the dreck and find the best, highest rated anything in any given area by meritocracy. I wanted to go to the best sushi-train restaurant (the kind with the conveyor belt) in the area, and found it, $1 a plate, and good stuff. Found their webpage, translated it with online tools, found it in the online map, sent it to my phone, and off I go with GPS directions. Yeah yeah anyone can do it, but despite having had these tools for many years, it still amazes me, especially when you can do it in a foreign country whose language you do not know, and an alphabet you cannot read. To think that just 10 years ago you wouldn’t have been able to do this; it’s an amazing travel and cultural immersion enabler. I wouldn’t even know how to spell this place’s name, that’s how Japanese it is. 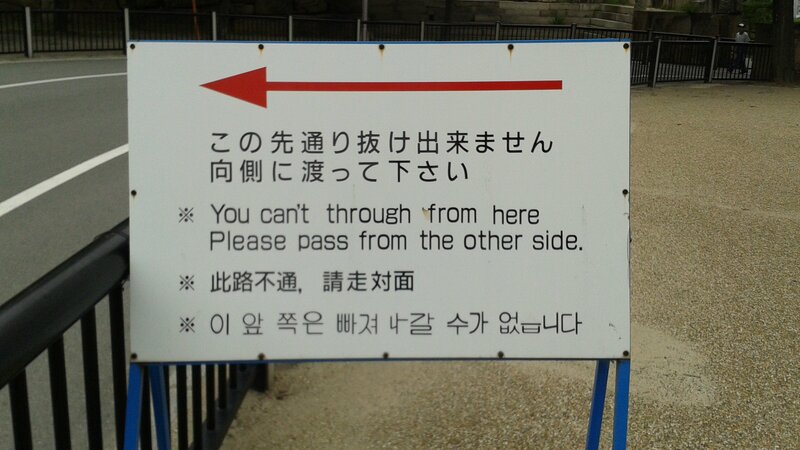 No Engrish signs = fun! 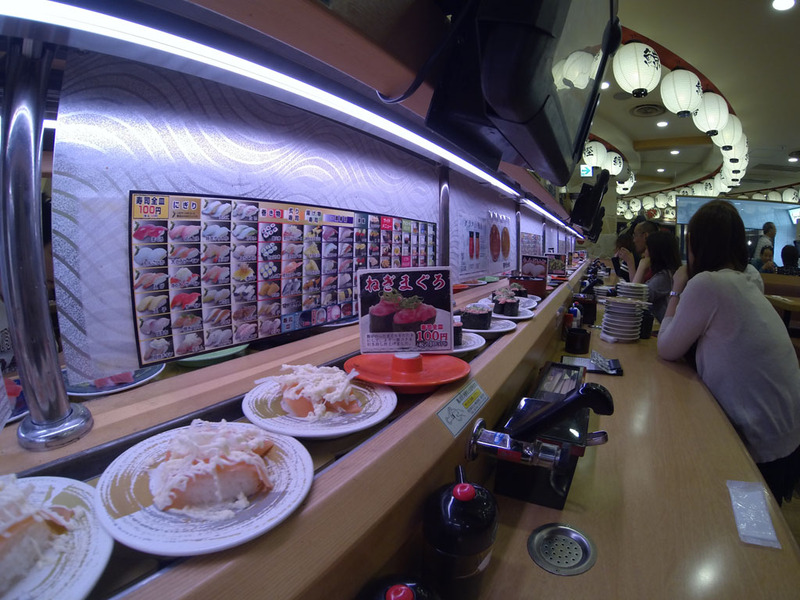 There must be 1/8 mile of sushi track in here. And, of course, more gyoza! I like how you can find little scenes like this, tucked away in corners and back alleys. 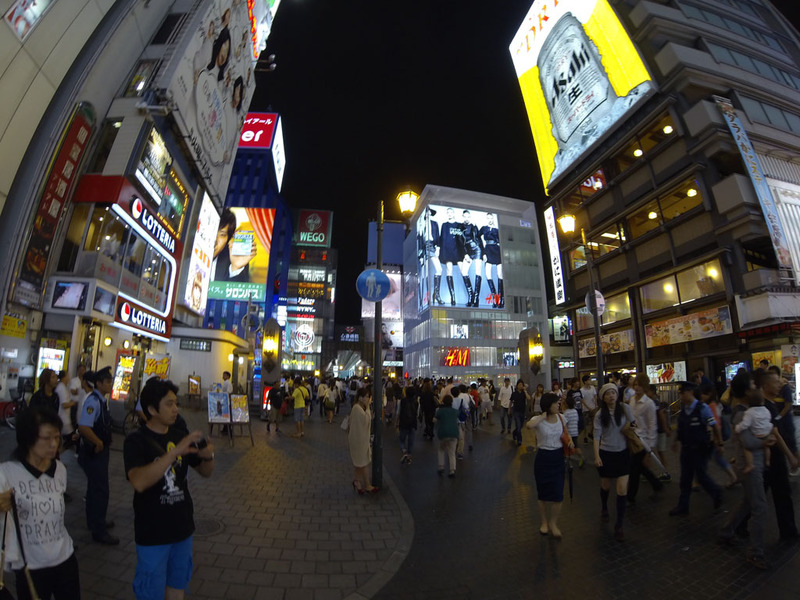 I ventured out around 8pm to see what Osaka is about when the sun goes down. Friday night, ought to be good. I started at a bar reputed to be a good place for expats, The Blarney Stone, and it was OK. I got there early, had a beer, and waited until the night’s band started setting up. People started to filter in, and it was a lively place. However a pint on an empty stomach is not a good way to start, so I left to find some eats. One thing you look for in street food environments is where lines are forming. That’s a signal of good food. Especially if other places nearby are empty or lightly-patroned. 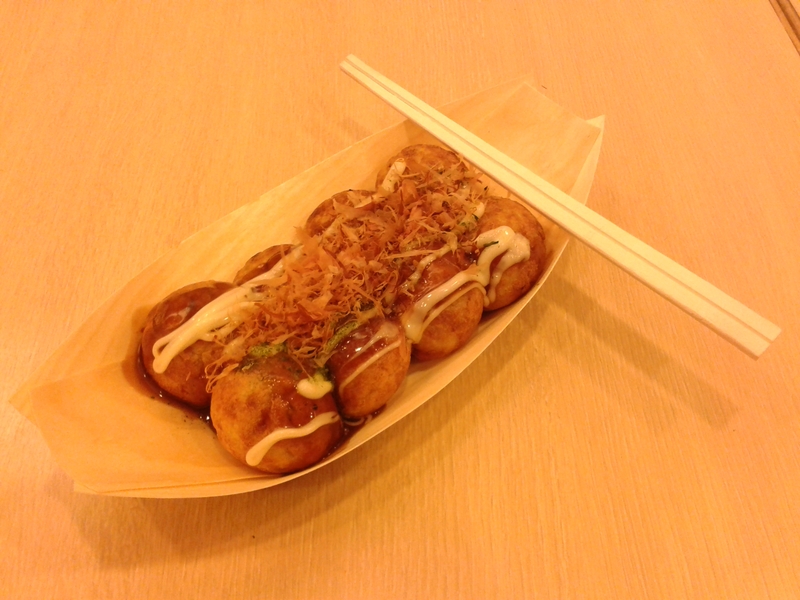 I siezed my opportunity for Takoyaki (octopus balls) at one of the populated stands, and was not disappointed. They were hotter than hell for the longest time, but once they cooled to an edible temperature, they were delicious. And, so cheap! Less than $5 for 8. With a side of rice or vegetables, this would probably be enough for a small meal. 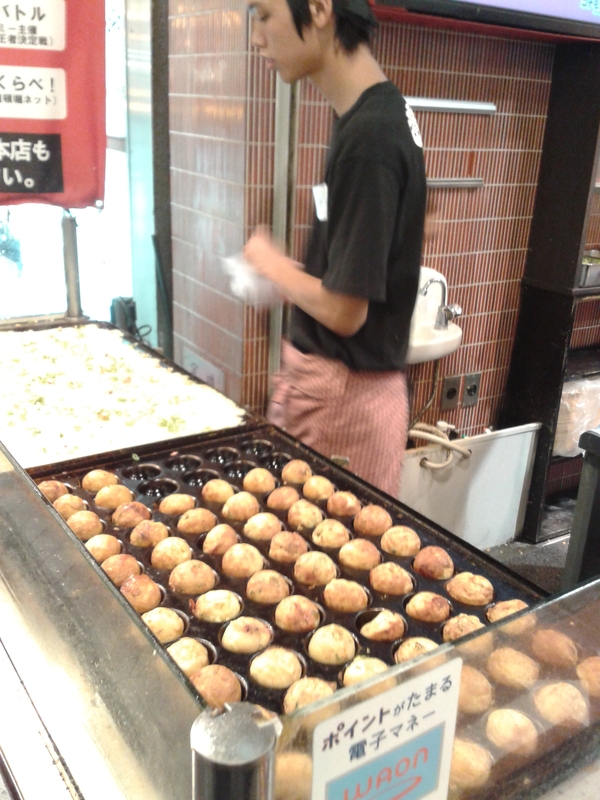 So what are Octopus balls? Well, they’re actually very tiny… Seriously, though, they are sort of cheesy dumpling-like things fried in a unique pan with spherical holes. The chef stabs them with sharp sticks in order to flip them so they cook evenly and don’t burn. 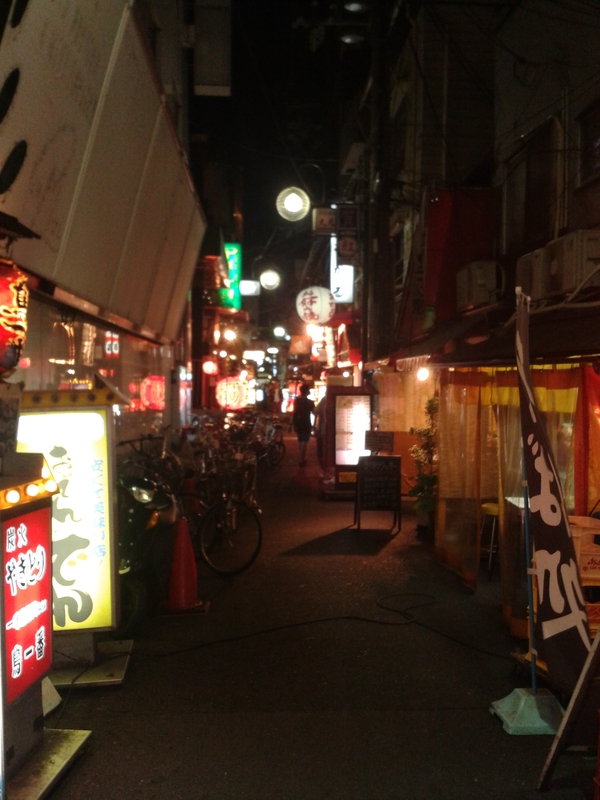 Next I wandered through the various arcades and alleys looking for something more than a snack. I found a restaurant that specializes in Gyoza (pork dumplings), probably one of my top-10 favorite foods. This place was no disappointment either. 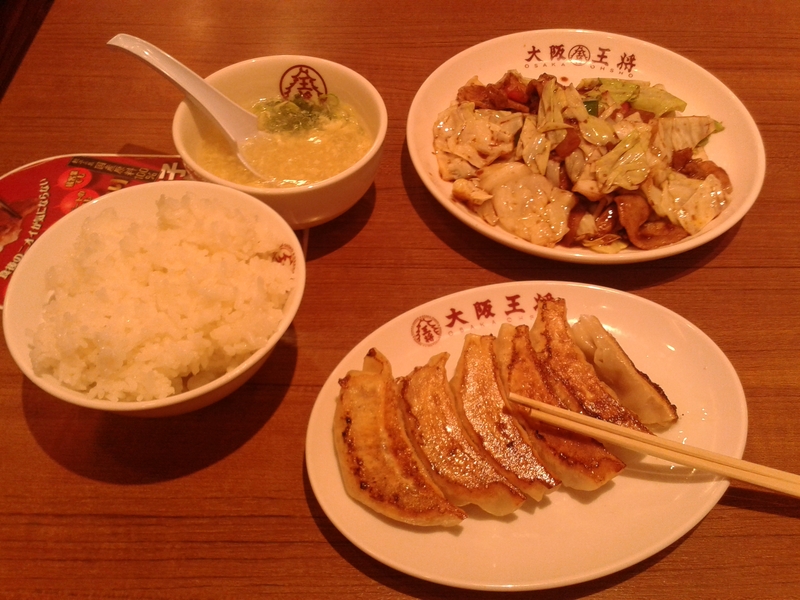 Less than $10 for a plate of Gyoza, rice, soup, and another plate of pork and vegetables. Definitely a full meal, and delicious. 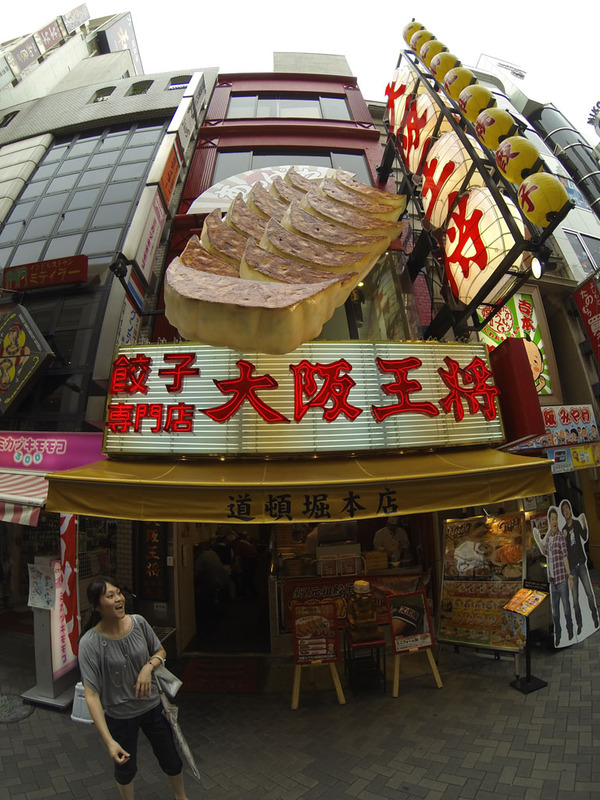 In Tokyo, calories were expensive and meals were small. Here in Osaka, the meals are still small, however the calories are cheap. It being a college town, a port town, and one of the food centers of the country, all combine into an excellent place for foodies and culinary adventure. I was thoroughly stuffed after this but still wanted to experience more so I decided I would find myself some ice cream. I wandered in and out of back alleys. Tiny little mom-and-pop places with seating for 5-6 people, all full. I remind myself to come back and try some of these places tomorrow when there is room again in my stomach. Strip clubs here, cafes there, neon and flashing signs and red lanterns stacked everywhere like something from Blade Runner. Every square inch oozing capitalism. My photos are terrible and cannot possibly do it justice. Finding no ice cream parlors, I opted for one of the dozen or so 24-hour McDonalds restaurants within a few blocks of my hotel, and got a generic ice cream. It will do. 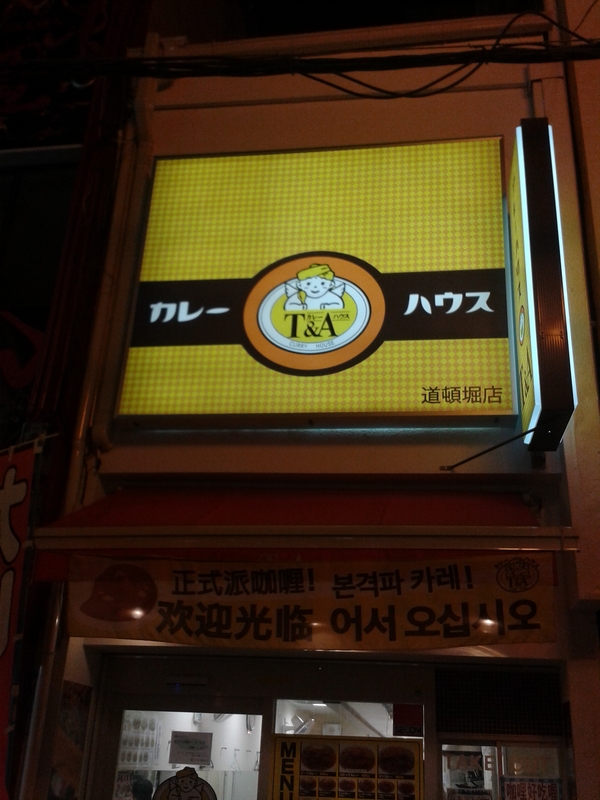 On the way I saw a place called T&A Curry House, which I thought was particularly humorous. Not as funny as Pho King Noodles (which takes the prize). This morning I hit the Kyoto Manga Museum before I left for Osaka. It’s an impressive place. Formerly a school, it now houses a simply massive library of manga (Japanese comics) and related exhibits. You can read archives of comics dating back all the way to the 60s. That’s if you can read Kanji. For the visiting gaijin, they have a small section of comics in foreign languages. The true immensity of this collection cannot be overstated; any fan of Japanese pop culture should go there and wander the 3 floors of shelf after shelf, and then reach their infamous “Wall of Manga” for a truly astonishing trip back in time through the history of it all. I wish I could share some photos of this place, but they forbade the taking of them. The shinkansen to Osaka didn’t take long, but then figuring out the Osaka subway system caught me off guard. There’s very little there in English, so I had to play Sherlock Holmes and match a list of English station names to the Kanji on the map. Then it was another adventure of figuring out how the crazy (non-Engrish) ticket machines work. 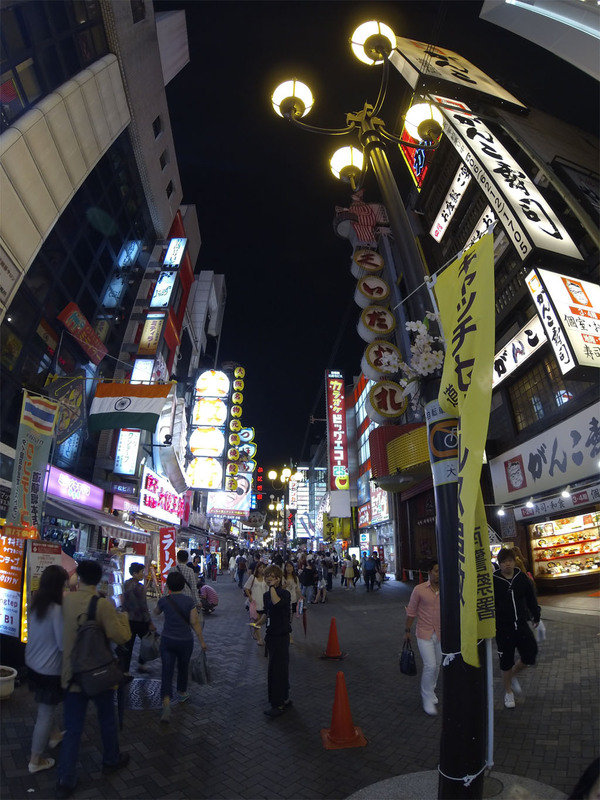 I booked a hotel near the famous Dotonbori area of Osaka, and it turns out I’m right in the middle of this area called Amerika-mura, which is Osaka’s version of Tokyo’s Shibuya. Crazy J-pop fashionistas and stores with anything you can imagine. 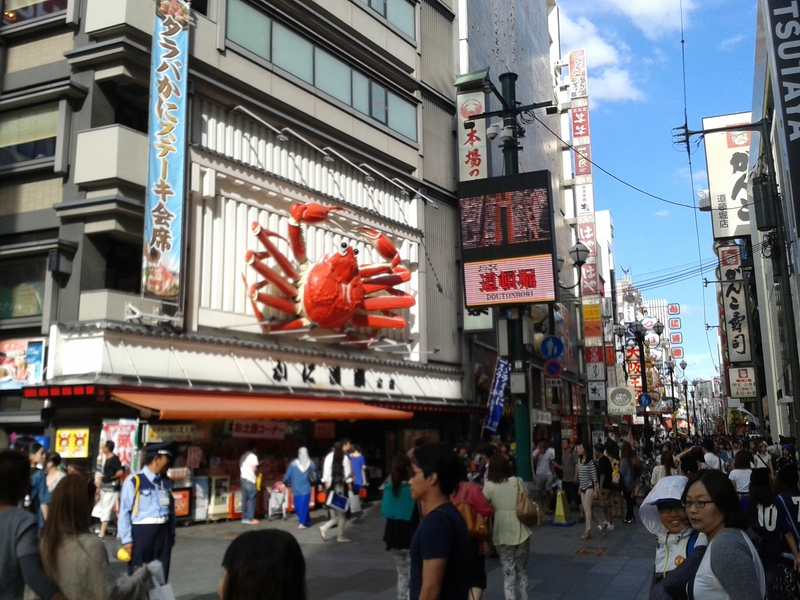 Just a few blocks walk to the arcades of Dotonbori. Everything open 24 hours, insanely cheap and delicious food in restaurants and on the street… I am going to bed early so I can wander the streets with the other vampires after dark. Probably the most cliche shot of this neighborhood, but I had to take it. The crabs’ legs are actually moving.